Today is the big day! The Ontario Table is one year old. Happy Birthday! Pretty compelling eh? That day marked the start of a year long road tour of book signings and local food events. At the end of the year, with your support, we compiled our own numbers and look at what you and I have accomplished together. We sold over 13,000 books throughout the province and beyond, gifted $14,000 to agricultural organizations that hosted us, created more than $150,000 in profits for farm retailers, and generated over $6 million in economic activity in the province of Ontario. In addition, the book was produced and printed in Canada meaning the Epulum Books team worked with The Ontario Table team to keep our money in our own economy where it helped to sustain jobs. We’re pretty proud of that as well. You and I together accomplished all of this simply by buying local. 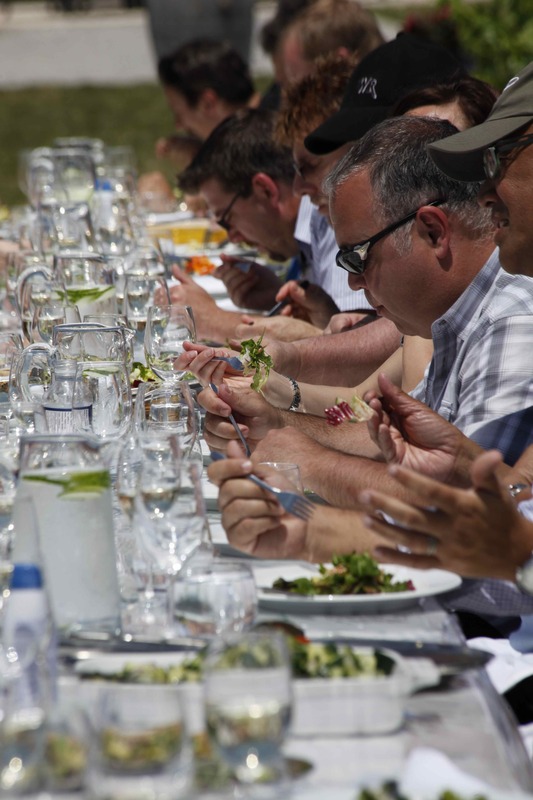 The Ontario Table is your best tool for buying local, it introduces you to the people who grow your food with simply, easy recipes to create delicious meals complete with Ontario wine pairings. 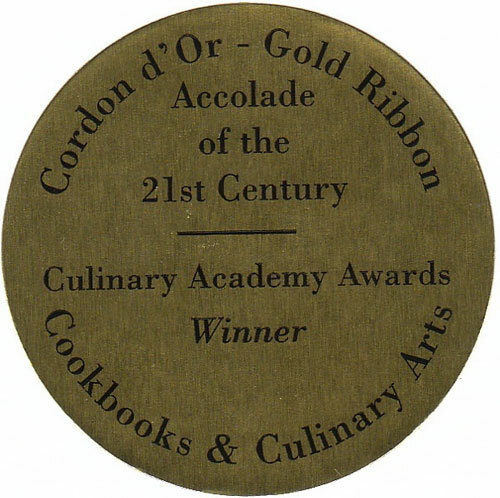 In the back of the book is a chapter called The Ontario Pantry. This helps you find foods in the grocery store that are 100% Ontario grown and end up in a tin, bag, bottle or other kinds of packaging. These little hints and tips will increase our local shopping and help to create a stronger food system in Ontario. This year is our year, you and I need to work harder to spread the message to others to buy local. Simply by buying The Ontario Table, you are accepting the $10 Challenge and making sure that when you spend your money on local items in small independent stores, it makes a difference to someone, some where. So where’s the party? It’s on The Ontario Table facebook page. There will be lots of cookbook authors and food bloggers from Canada and the USA chiming in with local food recipes today. 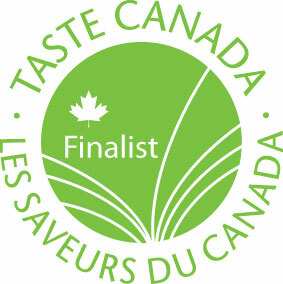 Check it out and let’s celebrate local food today. So have you heard of The Ontario Table-Cloth? As Jon and I toured the province last year signing books and attending local food events, we brought a few white tablecloths with us. As each of you bought a book, we asked you to tell us how you felt about Ontario agriculture by writing it on the tablecloth. You signed in black, chefs signed in red, farmers signed in green and celebrities in blue. Today we have 16 tablecloths full of declarations, pictures, logos and tributes in support of local food. It is the one and only tablecloth in the world of its kind! This year we are rolling out the tablecloh at farms in fields, orchards and vineyards and are serving up all sorts of local meals from breakfast to lunch and dinner. For a full schedule of these farm meals, keep checking the website. Some of them are already listed, more are coming as details get sorted out. If there is an event in your area, come out and support your local farmer, enjoy some great food and find out how convivial breaking bread with like minded foodies can be. Happy Birthday The Ontario Table and Happy Birthday to us all! May this be a healthy, happy and prosperous year for you and your family and I hope it will be another significant year for Ontario agriculture. *Numbers compiled by Dr. Kevin Stolerick of The Martin Prosperity Institute at Toronto University and Doug Vallery of Experience Renewal Systems. It was one of those perfect July days, only it was June, mid-June to be precise. The scene was a well manicured vineyard, a long, 50-foot table ran along side the rows with 80 chairs flanking each side. On the table was a very special tablecloth. 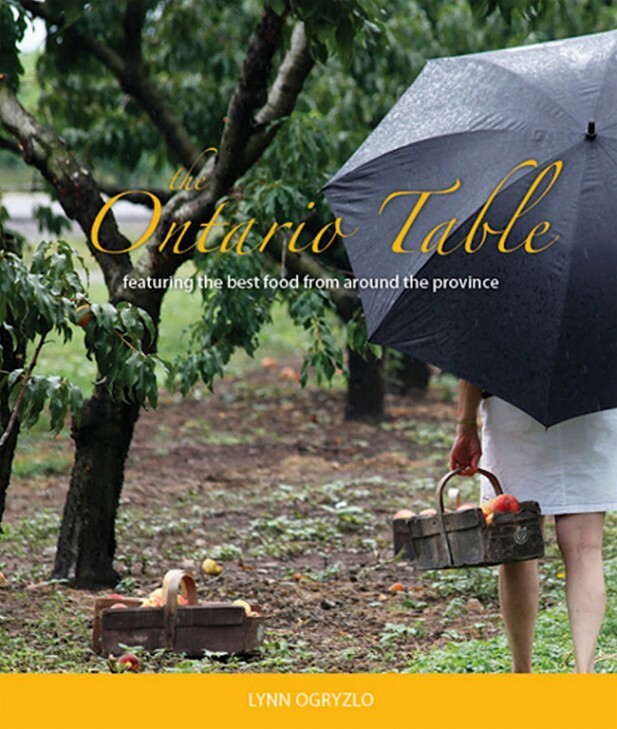 The Ontario Table is a project to promote local food. The project leads with the $10 Challenge. 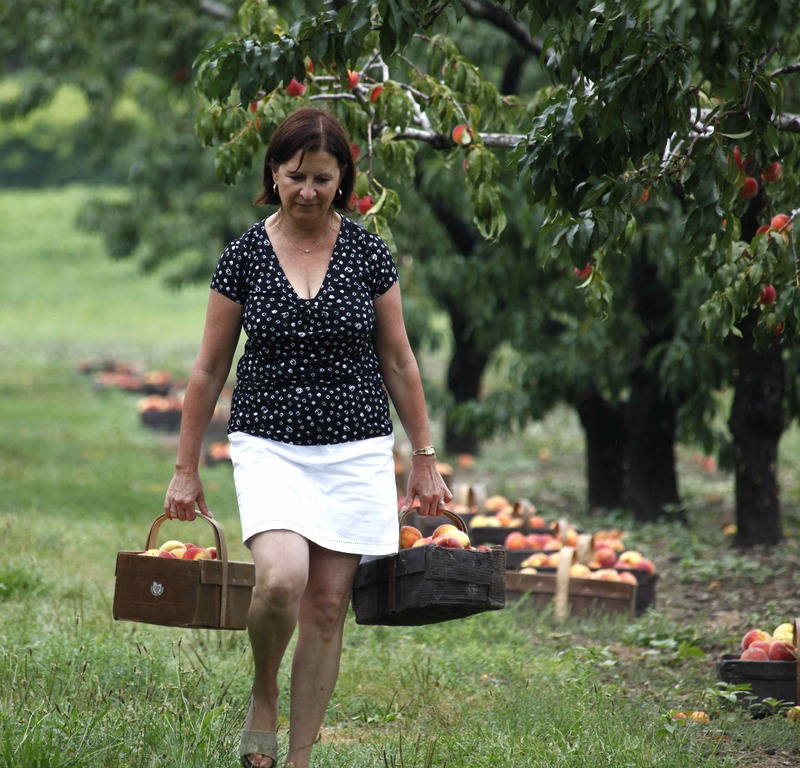 It’s a challenge to all consumers to spend $10 a week on local food. If we all did this, there would be an additional $2.4 billion in our local economy and would create $10,000 new jobs. As the book tour travels from Windsor to Ottawa, everyone who buys a book and takes up the $10 Challenge gets to write their pledge to local food on a white tablecloth. Markets and farms who host a book signing get to draw their logo in the centre of the tablecloth. Everyone who buys a book can write their pledge on the cloth. Some people write about their favourite farmers, others write briefly but to the point; some people are drawing pictures and others both. Consumers sign in black, chefs in red, farmers in green and food media in blue. To date, there are 16 tablecloths full of signatures, logos and pictures all a tribute to everything grown, raised and produced in Ontario. We call it The Ontario Table-Cloth and on this day we’re rolling it out, dining in the vineyard on food from neighbouring farms and wine from the vineyard. People, inspired by what they read on the table began talking about their own region, the farmers they know, the markets they’ve been to and the farm experiences they’ve loved. Today they were creating one more memory. Food more than anything else in life brings people together to commune and share in each others life. The photo album is right here. It’s farmers’ market season! Just last Tuesday, Minister of Agriculture, Food and Rural Affairs, Ted McMeekin opened a celebratory farmers’ market on the beautiful grounds of Queen’s Park in Toronto. It was like the kick-off, the firing pistol, the waving of the flag that starts a glorious, new season of farmers’ markets opening across the province with the harvesting of the best food grown and raised in Ontario. Following the Minister’s greetings, hundreds of attendees roamed the market sampling foods from farmers and some of Ontario’s most delicious commodity groups. First stall at the market was Farmers’ Markets Ontario. 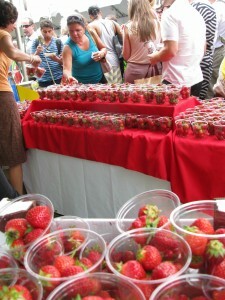 They had dozens and dozens of clear cups showing off the juicy, sweet strawberries. It was like a sea of red and people ate them up faster then they could keep them on the table. The Organic Council of Ontario had prepared a giant salad of organic chicken coleslaw that they were scooping out along with samples of yummy hunks of organic beef. Ok, so you had to travel backwards to eat the salad first and finish off with strawberries, but no one seemed to mind the order of food at this market. The Ontario Fruit and Vegetable Growers Association offered tastes of fresh asparagus spears cooked with parmesan cheese. Next to those samples were tiny cups of dried cherries – lunch and dessert together! The beef council went all out with large portions of steak gazpacho salads that people picked up and walked across to the Greenhouse Growers Association booth for cups of delicious, sliced tomatoes and hunks of cucumbers that they used as salad garnish. The sun was shining, the weather was warm and everyone was in the mood for locally grown Ontario food. In fact, everything points to a glorious summer and an even better growing season this year. To date, we’ve had fresh fiddleheads, rhubarb, asparagus and strawberries to fill the tables of the markets that are once again open for another growing season. I made my way through the market and enjoyed pulled pork from the Ontario Pork booth and then a larger than I should have had scoop of Kawartha Dairy ice cream. The flavour was Birthday Cake in honour of the Dairy Farmers of Ontario 75th year in operation. Then at the Independent Meat Producers booth they were sampling Gold and Silver medal winning wieners! Now this time I was in a good position, a delicious wiener in one hand and a sample of fresh mushrooms with spinach dip in another from Mushrooms Canada. It was difficult to decide which was my favourite Ontario food, but I did ponder this as I munched on Reif raisins and sipped on a glass of fresh apple cider. 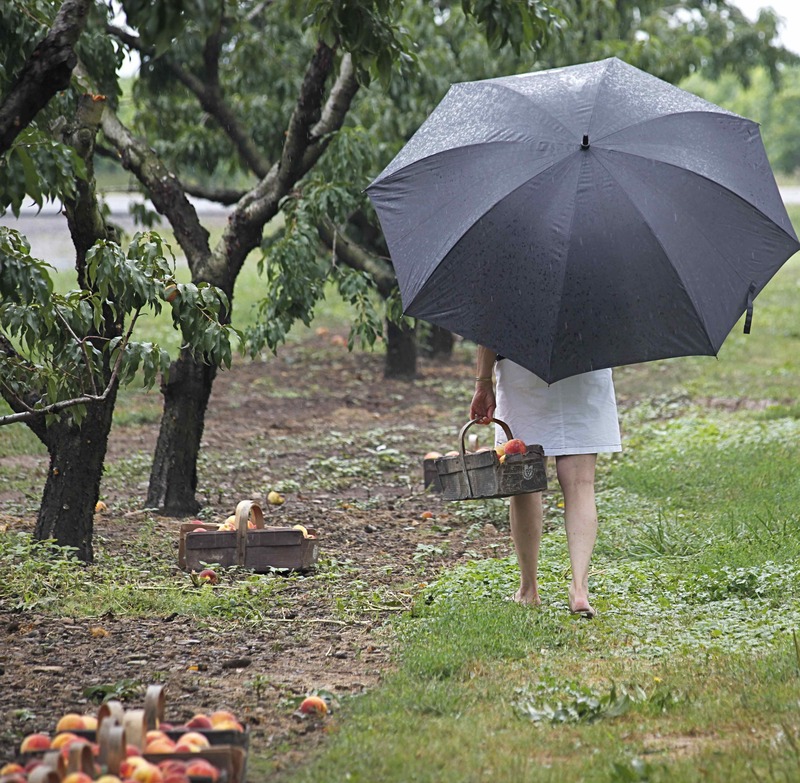 It’s not only the farmers’ markets that are opening right now, but on-farm markets as well. They’re great places to buy fresh food as well as jam, jelly and preserves. 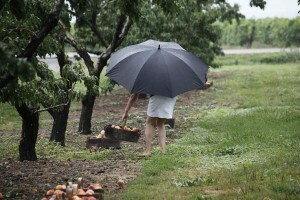 Today, more and more on-farm markets are opening bakeries and baking up seasonal pies and tarts. Visit one this weekend and you’re sure to find strawberry pies. It’s the season to get out and buy from farmers’ markets and on-farm markets where ever you are in Ontario and take these quick and easy recipes with you to get the most of the season. Click here for all the pictures. Ok, so I realized that the idea for a twitter party came to me one day when I was testing a new recipe. The recipe I was working on wasn’t working out and I had no one to talk with. So I adjusted and fiddled, omitted and prayed. In the end it was much better, but I thought perhaps there are people out there that may want to help test some of these recipes – after all, I think it’s fun. So the recipe is pretty much untested. So here we go. My neighbours Sue and Yvonne piled into the car and off we went to the Niagara-in-the-Lake Farmers’ Market. Today was a bit chilly and everyone was bundled in winter coats and mitts. There were lots of vendors at the market but no strawberries which was surprising because Quiet Acres is usually there with a table full of them. After buying some vegetarian burger patties, we headed down Lakeshore Road in the direction of Quiet Acres. Their shelves were overflowing with ruby red, beautiful strawberries. Maureen McSween is owner of Quiet Acres and said she’d just come back for more berries because they sold out at the market. Quiet Acres is one of the best places in my neighbourhood to get strawberries. I swear Maureen hand picks each berry because they’re perfect, candy sweet, juicy and OMG – this is what I wait all year for! With a flat of strawberries in the trunk of my car, the 3 of us headed home. Yvonne and I washed and trimmed them and we put 4 cups in a pot with half a cup of sugar. I cut the sugar in half because the strawberries were so sweet. It didn’t take but a minute for the strawberries to release their juices and I had lots of liquid in the pot. I added only 2 tablespoons of honey and Yvonne simmered the strawberries until they were soft, which was less then the five minutes suggested. We looked into the pot and right away I knew we had way too much liquid. So I ladled the strawberries into the blender taking as little liquid as I possibly could. I pureed the strawberries and ended up with 2 cups of really, really sweet puree that had a really strong taste of honey. This was set aside. Next I put a pot of water on the stove to boil. On the counter next to the stove I folded a kitchen towel and put a metal bowl on top. The towel keeps the bowl from sliding around when you begin whisking and it also frees your other hand to do other tasks. I whisked the eggs and sugar until it was a smooth yellow colour. 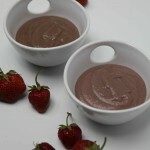 Then in went half a cup of the strawberry puree –the puree consistency was really good. I put the bowl over the now boiling water and whisked my heart out for about 2 minutes. I added the butter – not melted – why melt it when it will melt in the bowl? I continued to whisk for another 5 to 6 minutes, the butter melted and the curd was getting thicker and thicker. You can tell how thick it’s getting because in the beginning your whisking a liquid, soon you’ll notice the whisk leaving a few track lines in the curd, then when you whisk really hard, it actually leaves crevices and finally, when you can lift the whisk and it leaves an imprint on the top of the curd, you’re done. This didn’t take as long as 15 minutes for me. I poured the curd into a bowl feeling very disappointed with the colour that resembled milk chocolate more than strawberry curd and the flavour was ultra sweet – I mean over the top sweet and that’s not the result I wanted. So back to the drawing board, I put one cup of fresh strawberries in a blender and pureed them – no sugar. Now with the fresh puree, I made another curd. I still only used half the sugar and I eliminated the honey. I mistakenly used all of the strawberry puree (I forget to measure out half a cup). So the result? The colour was much better, the flavour beautifully strawberry, the texture was equally thick (even though I added more puree than the recipe asked for) and it was the beautiful spring strawberry curd with a real strawberry punch I was hoping for – perfecto! It took me two attempts but perfection came easily. I hope everyone else had fun in the kitchen. So now we all know that curd is not a real food on it’s own, so what do we do with it? My husband wants a spoon so he can eat it right from the bowl, but with all that butter, it’s all about moderation. No, I’d swirl strawberry curd through ultra thick Greek-style goat’s milk yogurt. I think the tang and thick texture would work beautifully with the sweet, luscious strawberry curd. Of course, real Greek yogurt is hard to get but you can use a Greek-style yogurt, spoon it in cheesecloth and hang it for an hour or two. It’s amazing how much liquid will seep out and you’re left with a drier, tangier yogurt. It’s the same thing you’d do to make Tzatziki. Here is the pic of the two curds. 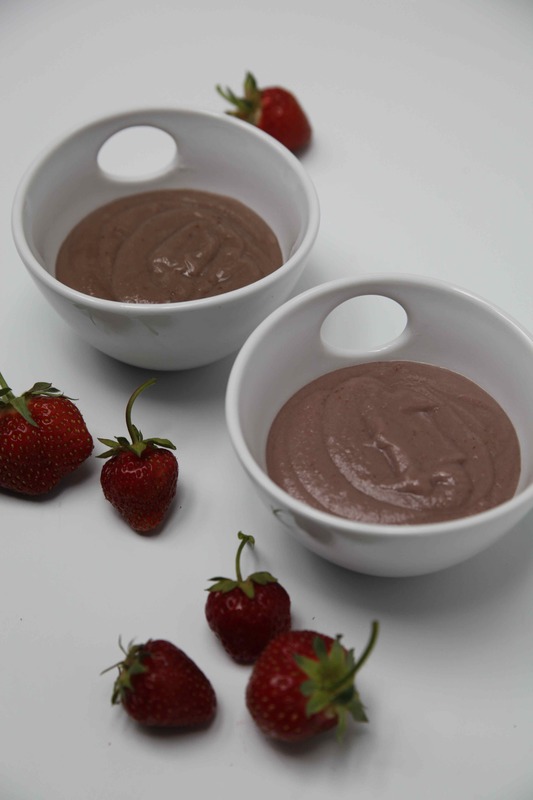 In the back is the chocolatey-like darker curd made with cooked strawberry puree and in the front is the curd made with fresh puree. In the top of a double boiler, beat eggs and sugar until yellow in colour and smooth. Add strawberry puree and whisk until fully incorporated. Add the butter and whisk until butter is completely melted and continue whisking until thick, about 6 minutes. Transfer to a bowl and allow to cool for a few minutes. Cover the top with plastic film to prevent a skin from forming. Makes about 1 ½ cups curd.